...Oven Mitt, in just a couple of hours! You may be thinking, why on earth would I make an oven mitt when you can pick one up so easily in almost any store, but I say why not?! Especially when you can make it all pretty and match your kitchen accessories. Once you've got the basic pattern you can go bananas with embellishments, yay! Here's how, lets get started! 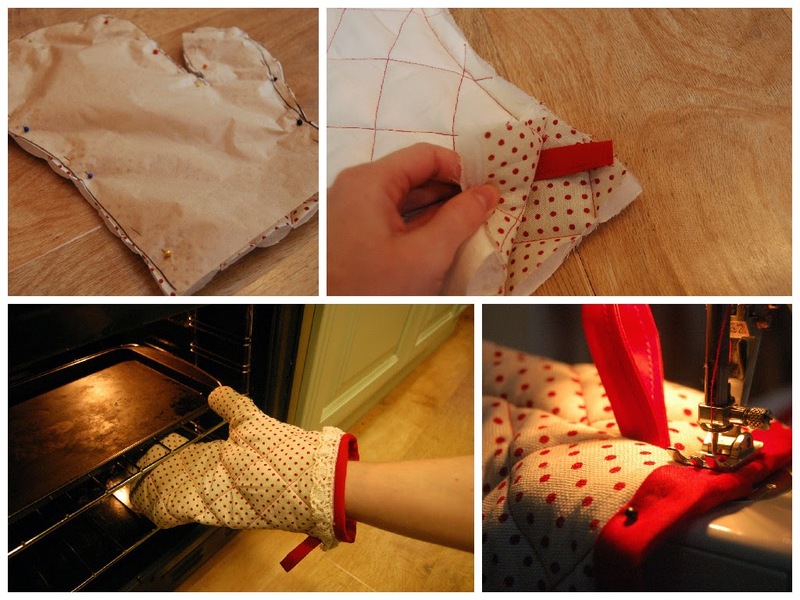 First you'll want to take your wadding and sandwich it between two pieces of fabric (one outer and one inner piece). Next pin and tack the fabric to the wadding to secure it in place. Repeat with the other piece of wadding and fabric rectangles. Next sew parallel diagonal lines all the way across the pieces of fabric/wadding in one direction, and then the other direction to create a diamond pattern. The spacing of lines could depend on your fabric design, mine were about 1inch apart. You should end up with 2 quilted rectangles. Lay your hand on the pattern paper and roughly draw round your hand with a space for your thumb, this takes a bit of judgment and practise as you don't want to end up with a really tight oven glove! Don't forget to add a seam allowance all the way round too (I may have done this 1st time around). Cut out your two quilted rectangles using your newly created pattern piece. Then pin and sew the two pieces right sides together all the way round, keeping the bottom open. If you'd like a little hook to hang up your oven mitt this is the time to add it in. Pop a little loop of binding inside the two pieces before you sew them together. Nearly there.... Turn the mitt the right way out and use the binding to encase the raw edges. Now the fun part, embellish embellish embellish! Lace, applique, ribbon, buttons, anything you like! All Done :) Well done. What embellishments did you go with? Hi again.... it's been a while!